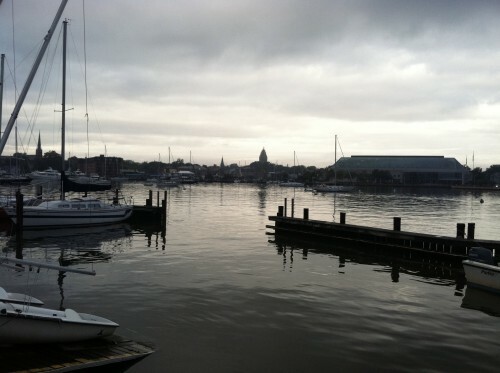 Day 2 of the District 11 Championship and Crab Claw Regatta at Severn Sailing Association in Annapolis started with light drizzle that would continue through out the day. At least that kept the power boaters away. The wind was in the mid-teens a little east of where it was yesterday and the temperatures just warm enough to wear summer attire plus a spray jacket. I did a lot better in today’s races – generally staying close enough to the lead group to nip at their heels. Sailing upwind was tough with the rain – telltales were unusable because they stuck to the sail requiring me to sail only by feel. On port tack the waves were a little more square on making it a challenge of picking when to point and pound through the waves, or go low and foot through the waves at a better angle. Downwind the waves were awesome – very little of the slop that we had yesterday and typically see in that sailing area (A) in Annapolis. I managed to catch the waves and S-turn in a way that I never have before. Almost every downwind I made up 10-15 boat lengths on the boats around me – I’m usually the one loosing a few boat lengths down wind. That was good enough for me to finish 12th and stay in the top half of the fleet. 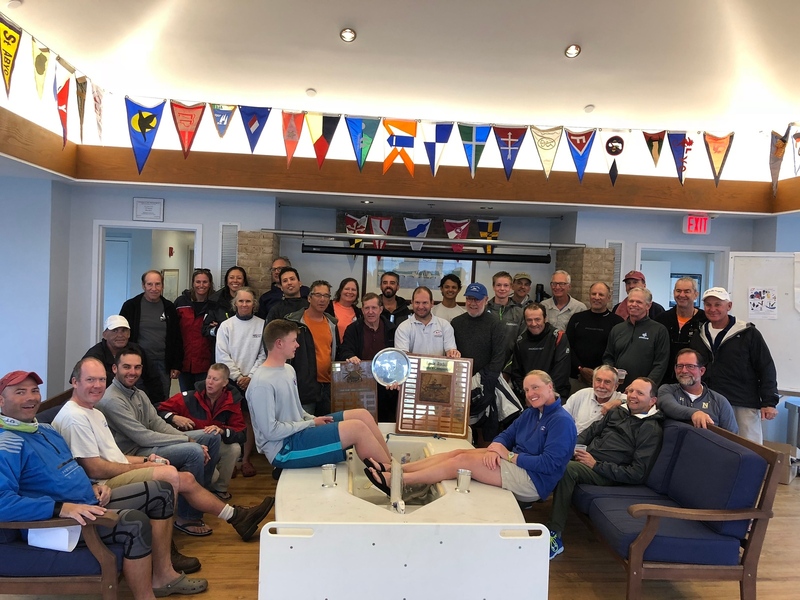 Big thanks to Scott and Dorian for organizing the regatta, Steven for the place at to stay and to PRO Steve and everyone else on the RC who ran the races! 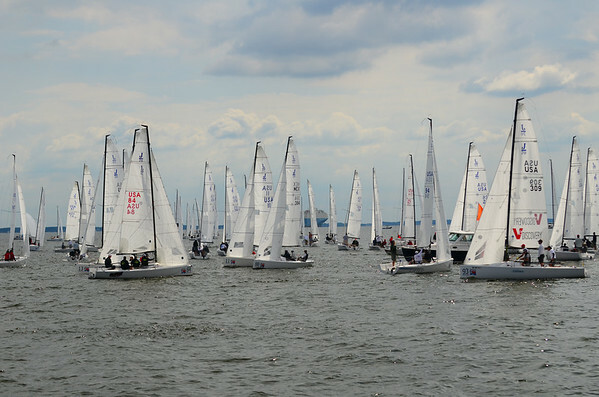 The first day of the Laser District 11 Championship and Crab Claw Regatta at Severn Sailing Association started with nice weather and winds in the upper teens out of the north. Despite the wind direction the temperatures will still warm enough for summer sailing attire, may just a spray top for some. I got off to a rough start racing – I was taking it a little easy in the stronger winds, in part due to an emergency room visit earlier in the week, to keep the stitches in my head dry and getting more comfortable not re-injuring my wrist. I also hadn’t figured out the right boat settings for the wind, and I was just plain tired. Note to self – don’t do these things again. So that led me to to not be totally aware of the course on a downwind leg and to confuse where the leeward marks were with the separate finish and I ended up rounding the gate the wrong way. I certainly wasn’t the only one, but I’d need to take a DNF. That wasn’t my only trouble, I also deathrolled downwind. 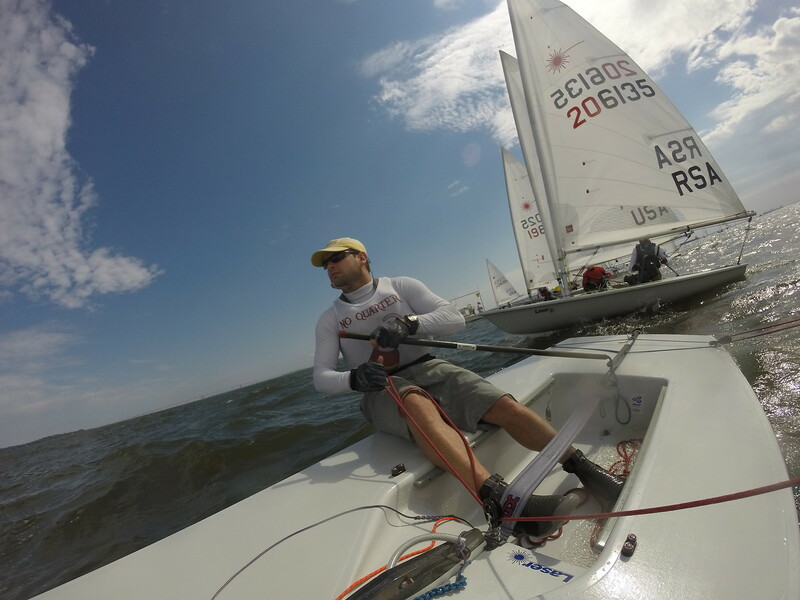 By the 2nd race the wind eased a little bit – still in the mid-teens. I had a great start and worked my way to the left getting almost to the layline. Once there I tacked and proceeded to botch it and not get under the boom and flipped over. When I came up, I reset the boat and I must have done something right because I was suddenly wicked fast. Like somehow fast enough to catch a boat that is normally as fast or faster than I am from 8 lengths behind and to roll over over them. I was back up with the lead group just behind them. Downwind I played it conservative to keep the boat upright and on the 2nd upwind I picked the wrong side and didn’t play the shifts well and would end up 13th. For the 3rd race the wind eased enough to be squarely in the 12-14 range that I am very fast in. I had a good start and sailed with the leaders the whole race. I was a pinch slow downwind, but felt more comfortable in the boat and had more confidence in my wrist. The 4th race was 11-13 and I did more of the same – this time getting as high as the top 4 or 5 at some marks. I actually start getting comfortable surfing the waves and actually had good speed downwind. I would end up 7th. The final race was a disaster again. The wind eased off to around 10 with lulls around 8 and the larger chop was still bouncing around making it tough to power over or through them. I had a good start, but didn’t keep my lane clear and got rolled – then I missed some shifts to put myself in the middle of the fleet. A deathroll and later fouling a boat to do turns meant I was racing for last and finished 20th. All in all it was great to be out racing, the RC ran great races and folks like Mike and Scott were having great days. 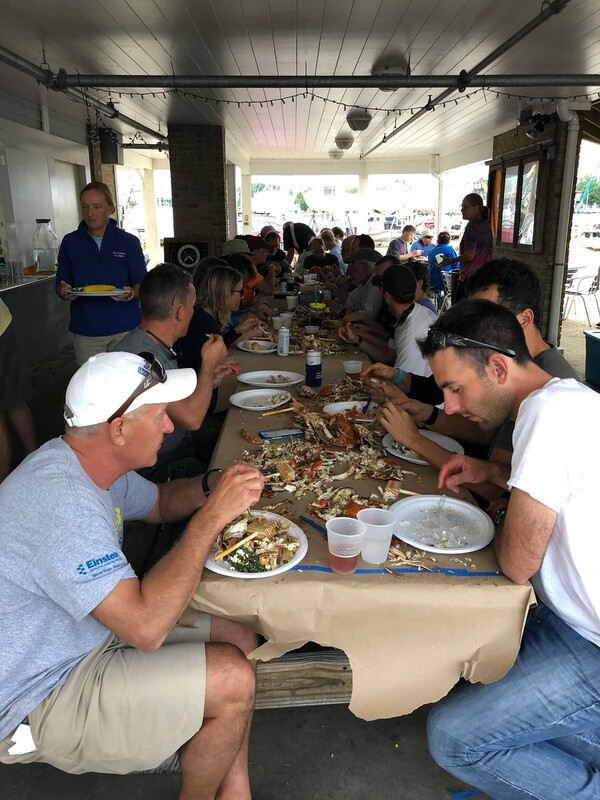 After racing I took a van-nap and we had a crab picking feast. I’m in 13th. Today’s forecast looked even worse than yesterday so the postponement flag was hoisted in the morning. We then proceeded to do all of the things that ensure wind – namely other things like packing the boats, going power boating and canoeing. And by 10:45 the faithful who stuck it out were treated to a 7-9 knot breeze from the SSE. We got 4 more races in before the time limit. I won the first race using a similar strategy to yesterday. But as the conditions changed in the 2nd and 3rd races and as I went into lead-conservation-mode – I found that everyone else was suddenly just as fast as I was and there weren’t many passing lanes. I settled for 3rd in the next two races and not knowing if there was a drop or not in the last race, I just figured I just had to be better than DFL. A 6 in that race ended up being my drop and I ended up 1st by 5 points. It was great for me to finally put more than a just few races together and get a good result. Thanks Steve, Dorian and everyone else for doing everything they did to put on the regatta. 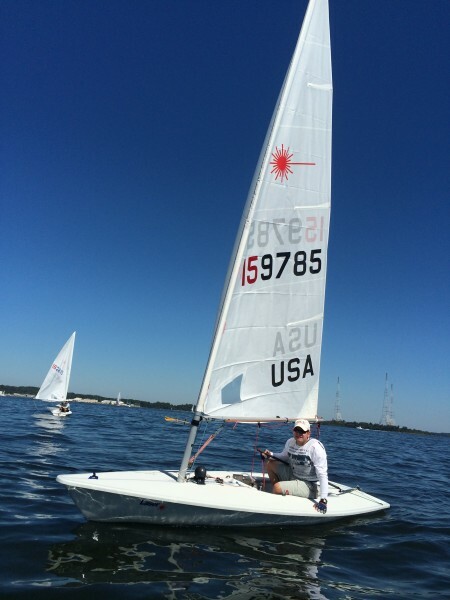 I enjoyed sailing with the SSA Laser sailors and look forward to sailing with them again soon. It was all doom and gloom on the forecast all week ahead of the Crab Claw Regatta at Severn Sailing Association and we were pleasantly surprised with the 3 races were were able to get in. 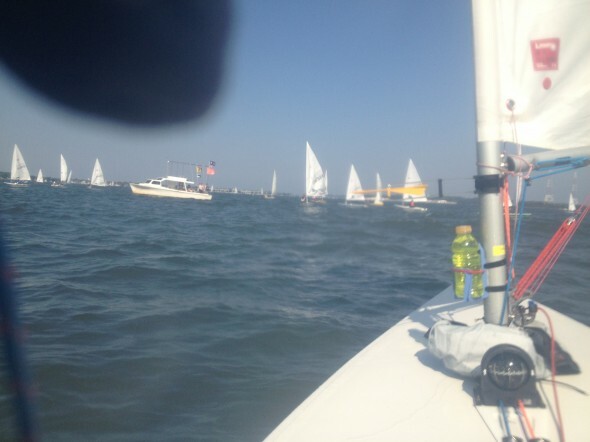 We headed out to the race course and got the first race off on time in a 6-8 easterly breeze just off Bembe Beach. I had remembered sailing in this exact location and with this exact wind direction and I remember the strategy was to go right or to go left – I just didn’t remember which way. At the start I wanted to be at the boat and to go right where there appeared to be more wind. I took a second row start just behind Luke Shingledecker and tacked to the right as soon as I cleared the boat. About a minute and a half later I realized it was the left that I wanted to be on because of the left-to-right current, so I tacked and continued, taking a few sterns, until I was left-most boat on nearly the lay line. Once on the layline the current carried me to the mark in the lead. I led the rest of the race favoring the right on the downwind and just doing my best to stay between myself and the pack of Jonathan Phillips, Luke and Bill just behind me. 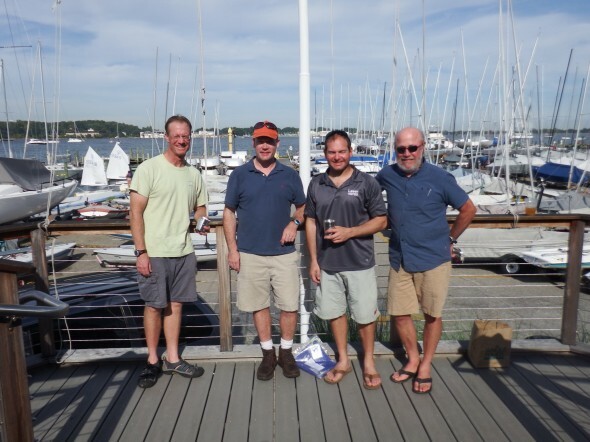 After the first race was completed – the wind completely shut off – just as was expected. We sat around in power boat chop for over 2 hours before the wind started to fill. This wasn’t the 6-8 that we had earlier in the day but it was a solid 6 – enough to call it racing – and not punishment. By the time we started the current was supposed to have changed so I again took a second row start behind Luke and worked the right. Once there I realized it hadn’t changed yet and again worked my way out to the left. This time Luke came in ahead of me and I followed him downwind. At the gate I saw some nice pressure on the lower right of the course so I stayed right while Luke went all the way to the left. I came back to the left lay line and was 5-8 lengths ahead of him when we reached the top mark. On the final downwind he closed the gap, but I was able to finish just ahead of him. For the 3rd race the pin was a little favored so I planned to start down by the pin with Carlos and Luke below me. I got there a little too quick and was OCS and so was Luke so we both tucked around the mark and restarted. I ended up with a nice lane and crossed behind most of the fleet on port until I got to clear air. Once in clear wind I worked my way back across to left-most boat and rounded only behind one other boat who was ultimately tossed for OCS. On the 2nd upwind of the 3rd race the course was moved to the left and this time I played a conservative middle-left to stay ahead of the guys behind to finish 1st. Despite the light wind and washing machine seas due to the power boat chop – it ended up being some fun racing. I appreciate that the RC stuck it out and we were able to race. I had the upwind boat speed thing figured out and while there were some things I could have done better – I didn’t make any mistakes and that got me to the front and let me stay there. It was a nice accomplishment putting a whole race day together after the mistakes I made last time I was racing at the Laser District 11 Championship in August. The forecast for Sunday is even more dismal than today’s, but we do start an hour earlier so I’m hoping we get some more racing in and I can keep the streak going. 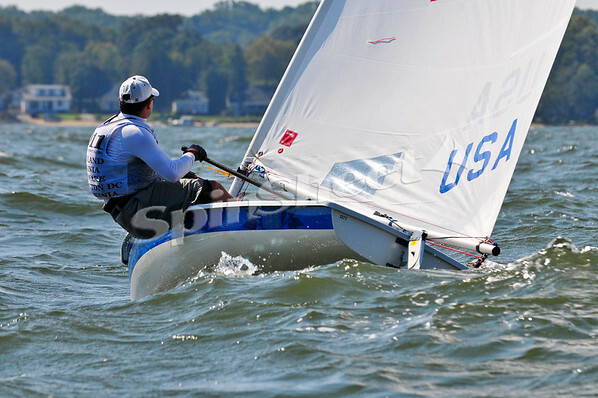 Sunday’s racing at the Laser District 11 Championship in Annapolis started out much like Saturday, but with less wind. We started the first race under mostly cloudy skies and 8-10 knots of breeze. After a general recall under P flag the RC went straight to the black flag. I had a decent start near the boat end and worked my way out to the right along with Ted Morgan. Karen long hit the right even better than we did and rounded the mark first with me and Ted just behind her. Downwind I got ahead and put some distance between myself and the group just behind me. From there I just kept ahead on the remaining 3 legs and took the gun. Sunday’s 2nd race didn’t go so well. My start wasn’t as good and I got behind early by being on the wrong side of the shifts on the first beat settling for a 12. 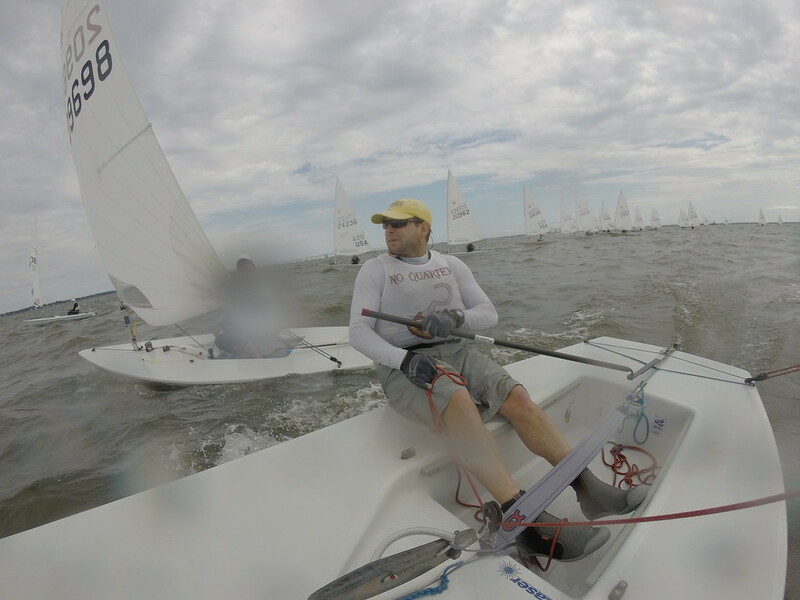 The thing I learned in the 2nd race was that the mode I was using to make the boat go fast upwind in a little more wind and more chop, stopped working when the wind lightened and the water got flatter. By the 3rd and final race the wind was pretty light and the chop was just the random power boat variety. We were moving, but it was slow going at times, particularly downwind. I won the boat at the start and again worked my way up the middle right. This time the far right didn’t pay. 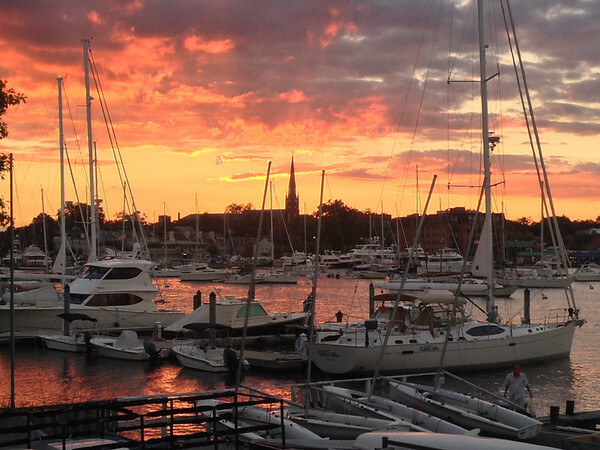 And much of the fleet had gone left hoping it would pay off like it did last race – it didn’t. I rounded 2nd just behind Brady White with Brett Morris behind me. Brady extended his lead and I was able to hold off Brett. We would go on to finish 1-2-3. With that finish and knowing several boats would have black flags, I knew the top 2-7 boats would all be pretty close. The 1 & 2 today certainly helped, but the 12 meant I’d have to keep a 10. In the end it was the bullet that won me the tiebreaker for 3rd place overall. Despite the light winds, it was fun to be competing at the top of the fleet – especially with some sailors who I’m usually following around the course. And with 34 boats there were plenty of sailors keeping the competition close. Thanks again to Steven Cofer and everyone at SSA for hosting our championship! 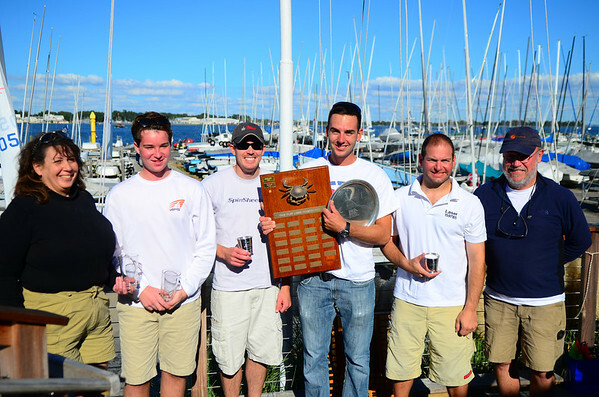 And congratulations to winner Mike Russom who sailed a very consistent regatta with top 5 finishes. 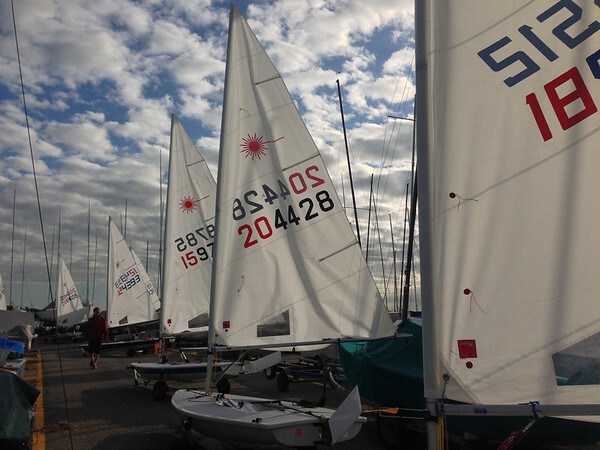 We started the 2013 District 11 Championship with 32 standards and 9 radials at Severn Sailing Association. It was overcast with and the wind was blowing 8-12. Out on the water we had a bit of a time getting started with the current pushing us over and multiple general recalls and restarts. I didn’t have a particularly great start in the first race, but I made my way to the right and picked the shifts up the beat catching boats on every upwind. As the race went on the wind started dropping and was 7 or 8 with left over lumps and chop. I ended up 7th. In the 2nd race I had a terrible start and won the 6th row getting shut out at the boat. I worked my way up the first beat just looking for clear lanes and only had 4 boats behind me at the first mark. Downwind I picked up boats and I picked up another handful on the upwinds. Salvaged a 10th. For the 3rd race we still had a 7-8 knots and the chop started going down a bit. I had a great start, but let Brady and Mike get ahead and to the right. I followed and when they broke to the left I hung out to the right and crossed both of them. I was first at the top mark and lost a boat downwind. Mike Russom was fast and made a good comeback. But Ted Morgan had the best lines and speed and beat everyone at the top mark. I held onto 4th. After racing we had crabs and listened to a band on the SSA deck. 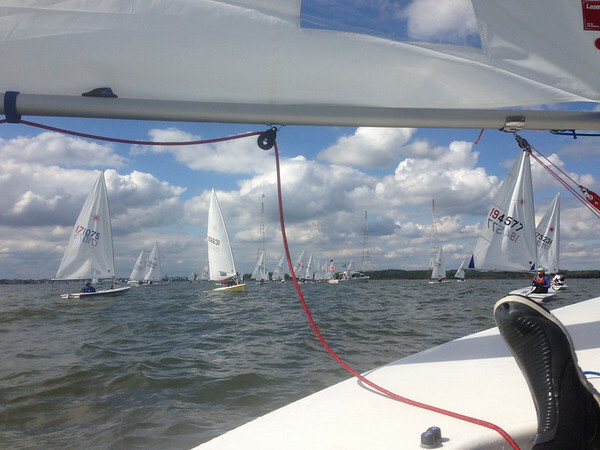 This weekend is the Laser District 11 Championship at Severn Sailing Association. The J70 North American Championship is going on Thursday through Saturday with 90 boats and so I decided to come up a day early to go out and spectate. 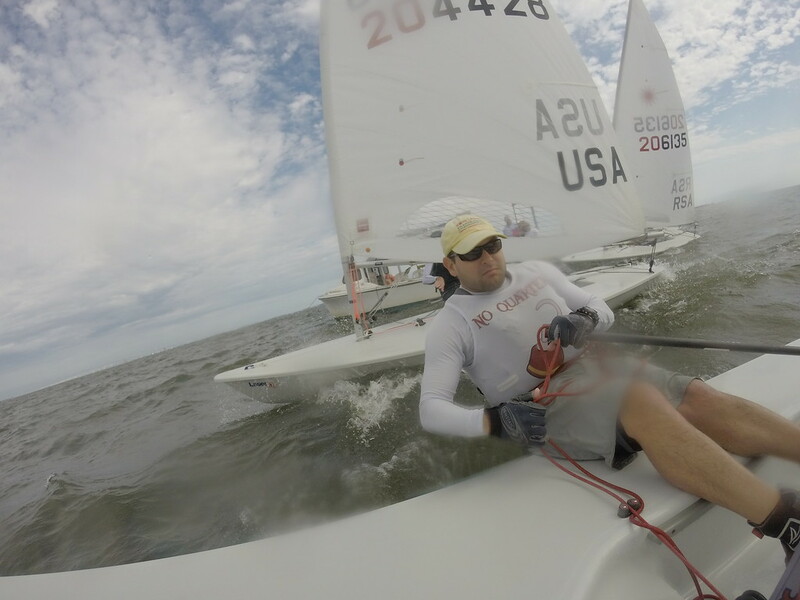 The wind didn’t cooperate much and after 4 hours sitting on the water, racing was cancelled for the day. While we didn’t get to see any sailing, it was still nice to get on the water. Thanks to Brian Reagan for the ride out to spectate. Tomorrow we’ll have 40+ Lasers and Radials out for our two-day championship. Lighter winds are expected which just means – it’s anyone’s race to win! 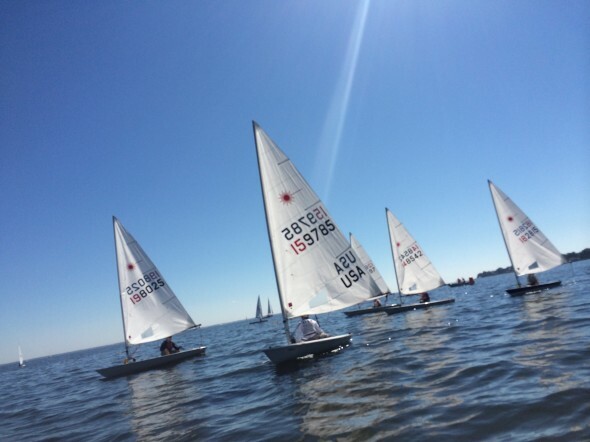 We sailed another 3 races on Sunday to complete the District 11 Championship. The wind started out around 14-15 out of the north, north west and died off to about 8 by the end of the 3rd race. It was very shifty and challenging. I put up a 9-4-9 today to finish in 6th. Best part of the day was on the first beat in the 2nd race when I pulled off a perfect pick move when the Schooner Woodwind crossed behind me and blanketed the entire rest of the fleet (seen above). 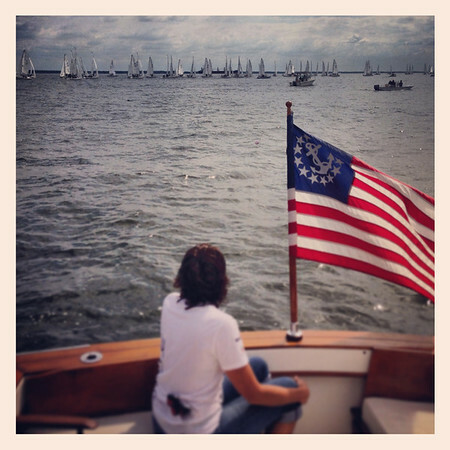 Here’s a picture from sailing on Saturday that was posted on SpinSheet’s website. 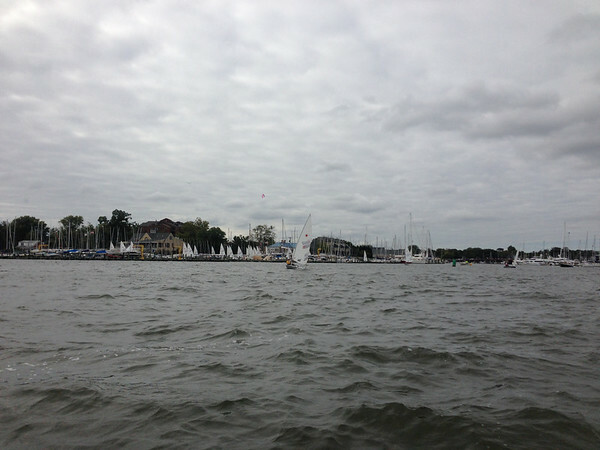 We had an absolutely beautiful day in Annapolis for the first day of the Laser District 11 Championship with 33 boats. We did 4 races in 15-18 knots with each race taking about 45 minutes. We sailed in their area C which was just north of Tolly Point with the wind at 200-180. I did a reasonable job keeping up with the lead pack in winds that were right at the very top if not slightly above my competitive range. Having finished 5-7-7-10 I’m in 7th and looking forward to the slightly lighter winds predicted for tomorrow. Results. The racing at the Crab Claw Regatta at Severn Sailing Association was marred only by a lack of wind this weekend. 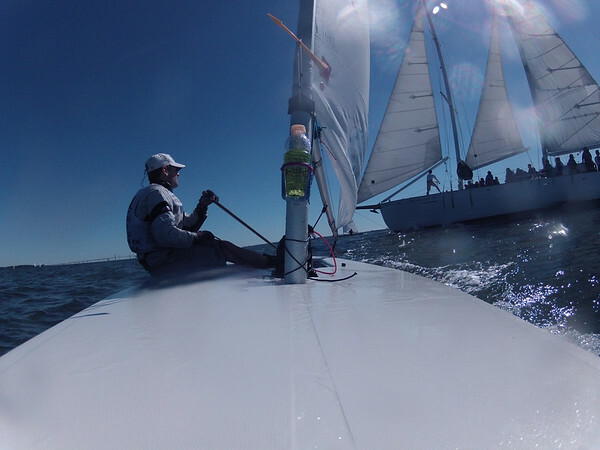 On Saturday we had just enough wind to get out to the course and sail 1 shortened race. On Sunday we ‘sailed’ out to the course in almost no wind and after waiting around for 2 hours we abandoned having not sailed a race. In the one race we did sail, I got a good start on the favored port end and headed out to the left with the leaders. I came right a little too early and was 9th around the top mark. Downwind I picked up a couple boats and then the wind went right for the shortened course upwind to the finish and I was able to pick off one more boat to finish in 6th. Even thought the sailing wasn’t so great, the weekend was still a fun time hanging out with the Laser sailors and catching up Saturday night with Lud and Blake who were delivering Impulse from Newport to Deltaville.